Easily integrate our Phone Validator API into your webform, CRM, or app. Check if phone number is active at point of entry into your system and keep your data clean. 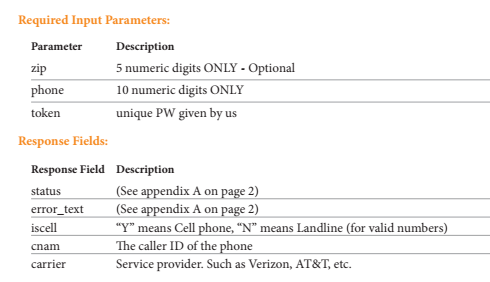 Live telco data provides up-to-the-minute accuracy (no stale database lookups here) and returns connection status, line type detection, and carrier ID. Start a trial and be up and going in under 5 minutes! The information above will be used to start your account. We respect your privacy and don’t like spam. We will never give, rent, or sell, your information (name, address, email, etc.) to any third party. © 2018 RealValidation™ - Real Phone Validation is a service of RealValidation, Inc.